The kids had only been awake for 10 minutes this morning. I hadn't even fed them breakfast yet and I couldn't find Lincoln. He LOVES to play hide and seek, so I started looking in closets and the pantry and the bathrooms, all the usual places and still couldn't find him. I couldn't hear him either, which was unusual because he's always laughing when we look for him. 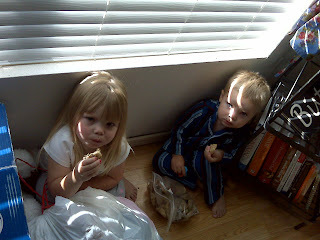 Finally I looked over at the window to open the blinds, and Linc was sitting on the floor crouched in the corner with a bag of 3 dozen chocolate chip cookies. Lezlee joined him before I could stop her. I love the look his face. Busted! Just think, Quince will be able to join them in their all mischievous adventures in a few months. uh oh! but they are SO cute! !